Cebu Pacific Promo Fares 2019 to 2020: Cebu Pacific Promo Fare 2014: 75% Off on Fares! Cebu Pacific Promo Fare 2014: BiyaHELP! Help rebuild a nation while you're on vacation. Our latest #CEBseatsale is up. 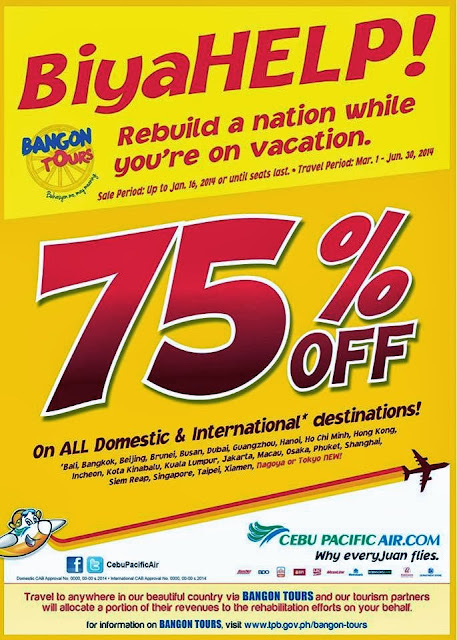 75% off on all flights! May cauayan isabela po ba? hm davao-cebu vice versa ?? how much the roundtrip flight for Manila-Dumaguete-Manila on March 7-14, 2014? manila to tagbilaran roundtrip for 2,on may 7-9 please?